The Sotheby’s International Realty® brand can’t get enough of 169 Ansley Forest Drive in gated Estuary. 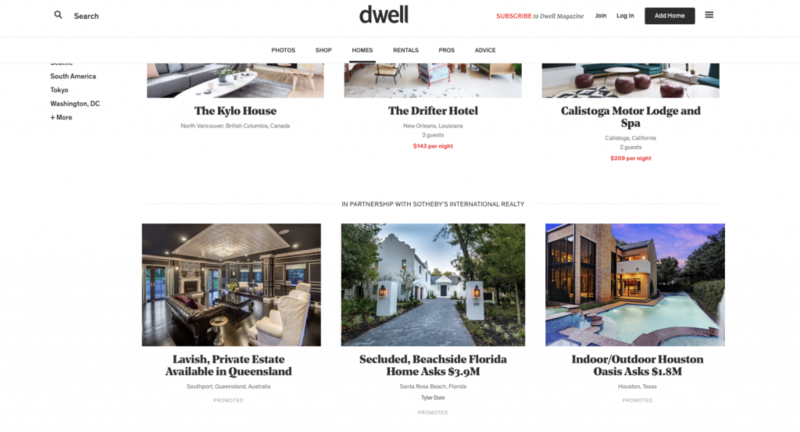 Previously featured as the brand’s Extraordinary Property of the Day, the Santa Rosa Beach, Florida home is helping mark the return of dwell.com to the Sotheby’s International Realty 2018 Media Plan as one of six homes promoted within the Dwell Homes Channel and Real Estate Section. Running throughout the month of March, the exclusive Sotheby’s International Realty brand promotion enjoys 100% SOV (share of voice), which means every time the web page is viewed, three of the six selected properties will be showcased. As the leading voice for modern design, architecture, and interiors, dwell.com reaches an affluent, sophisticated, and design-savvy audience. Dwell has been a modern design icon for the past 17 years, and its website reaches over 1 million unique monthly visitors. Inspiring Dwell’s engaged Instagram audience of more than 1 million home enthusiasts, the Sotheby’s International Realty brand will highlight select properties for inclusion in Dwell’s Photo of the Day. This promotion will also feed their Facebook audience, reaching an additional 800,000 plus consumers. Selected from more than 40,000 properties currently marketed under the Sotheby’s International Realty brand, 169 Ansley Forest Drive is in the company of properties that include a lavish, private estate in Queensland, an indoor/outdoor Houston oasis, and an oceanfront wonder in Carmel, just to name a few.